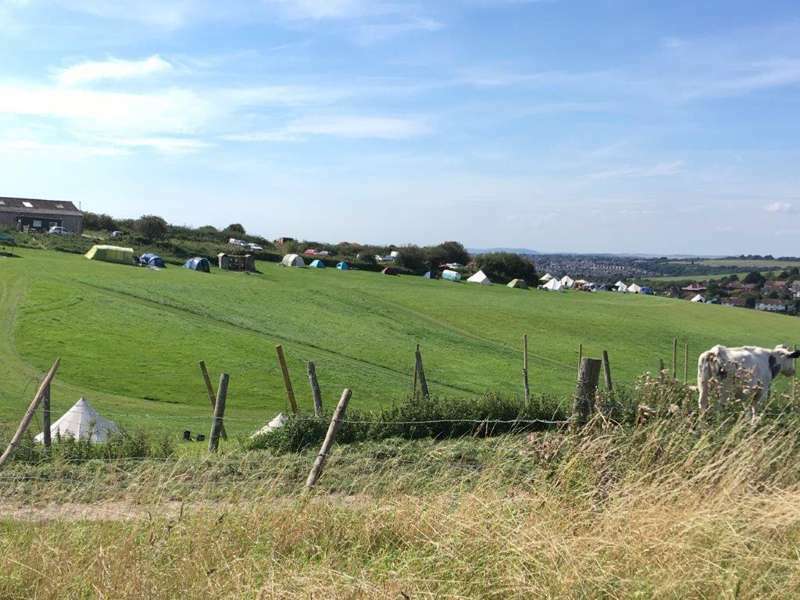 The rolling hills, fantastic views, great walks and picturesque villages of the South Downs National Park offer a blissful taste of country life and make it a great location for a camping or glamping holiday. The fact that it’s only an hour from London and within easy reach of much of the south coast are added advantages that make weekend escapes here a real possibility for many. 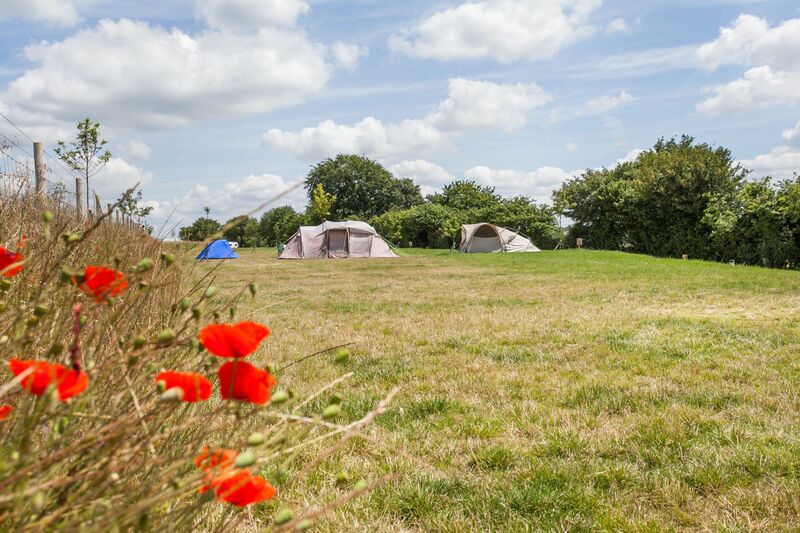 Whether you want to walk and camp along the South Downs Way, to escape the city for a day or two or settle down for a week-long family camping trip, our collection of South Downs campsites should have something to tempt you. The South Downs National Park links some of the south of England’s most interesting destinations via rolling hills, chalk grassland and endless farmland. Stretching from Winchester in the west to Eastbourne’s towering white cliffs, the national park is centred around the South Downs chalk ridge where outdoor enthusiasts will fit right in. Walking, running, cycling, horseriding, paragliding and, of course, camping are just some of the ways that you can make the most of the rural scenery and far-reaching views. And the Downs never stray too far from the south coast, so you can easily spend time at the seaside from a base in the national park too. Whatever your reason for visiting, we think you’ll find a camping or glamping site to suit you in among our collection as we’ve handpicked only the best campsites in the South Downs National Park to feature here. 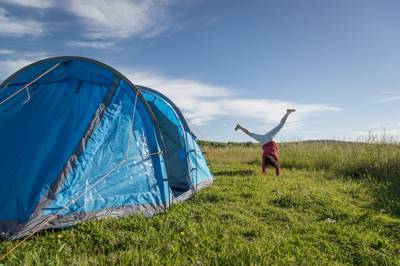 The popularity of walking the South Downs Way long-distance footpath, which stretches from one end of the national park to the other, means there’s a demand for tent camping sites in the South Downs National Park. But whether you’re a backpacker with lightweight gear or a family looking for an electric hook-up, there are plenty of campsites to choose from in and around the national park. 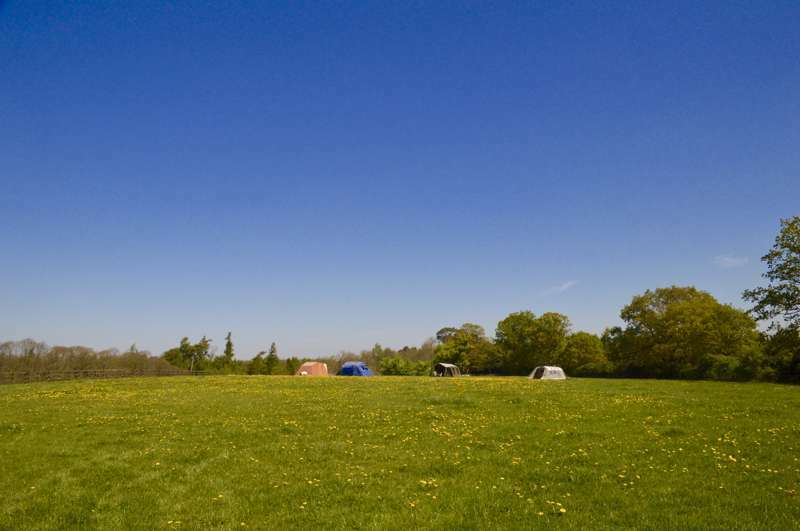 There are plenty of farms and smallholdings which fling open their gates in the summer and also a number of more-established campsites with facilities to match. Here at Cool Camping, we have a soft spot for classic campsites and we think that pitching a tent is the best way to enjoy our national parks. After all, these areas are some of the most beautiful in the country and have been deemed as being nationally important. Not only does tent camping immerse you in these beautiful landscapes, but it also has the least impact on the land – so you can feel pretty smug about your green credentials too. If tent camping appeals but sounds a little too much like hard work, how about glamping in the South Downs National Park instead? It’s the perfect way to experience the outdoor life without the hassle of actually pitching a tent – and if you haven’t got your own camping kit, it offers a comfortable solution. 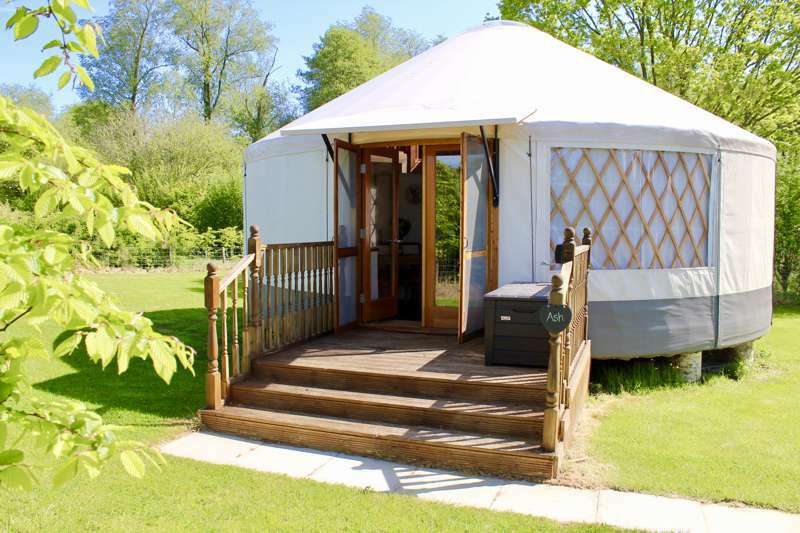 The South Downs and surrounding areas in Hampshire and Sussex, offer plenty of glamping opportunities with every type of accommodation imaginable. You can choose to stay in a pre-erected bell tent, yurt or safari tent or opt for something more solid like a shepherd’s hut, gypsy caravan or cabin. Then there are the truly quirky options; we’ve seen them all and stayed in them all. Today’s glamping scene includes incredible treehouses, imaginatively-converted vehicles and one-off constructions that have to be seen to be believed. Whether you want glamping accommodation for a romantic retreat or a family weekend away and whether you prefer traditional or wacky, you can rest-assured that the Cool Camping team put as much effort in to selecting the glamping accommodation that features in our collection as they do to the classic campsites. Whether it’s a tent pitch, tipi or treehouse, if it’s on our site, it’s had the thumbs up from our travel experts. If you’ve got kids and you haven’t taken them camping yet, why not? Kids love camping – it’s a truth that’s almost universally acknowledged. Pitching a tent, sleeping under canvas, toasting marshmallows on the fire… the adventure of camping is enough to keep children (and us outdoor-loving adults) happy but add to that the chance of making new friends on site and the exploration and discovery that comes with a holiday and there’ll be smiles all round. Walking, cycling and horseriding on the South Downs Way are great for active kids and there are plenty of family-friendly attractions nearby too from farms to seaside funfairs, castles to wild animal parks. If your family isn’t complete without your four-legged friend, you’ll be looking for dog-friendly campsites in the South Downs. The Cool Camping collection features plenty of these and you can filter your search to find only places that will welcome your dog. After lots of fresh air and exciting days out, kids (and dogs) are often worn out which can make bed times easier than you’d think. And once the kids are tucked up in their sleeping bags, the adults can enjoy staying up and sitting round the fire or gazing up at the skies for a spot of stargazing. If you’re looking for a place to get away from it all – including the kids – the South Downs National Park is a top pick. A camping or glamping holiday here can make for a great romantic getaway; think countryside views, candlelight, campfires and stargazing. Pitch your tent or choose a glamping pad that’s just right for two and you can spend long days walking and exploring before nights by the fire. Stately homes and gardens, picturesque gardens and pubs, vineyards and craft breweries… the South Downs National Park has a host of attractions that offer great days out for grown-ups. 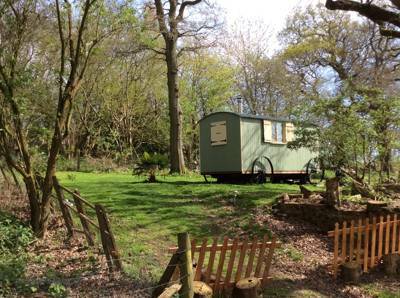 And a two-man tent, cosy campervan or a traditional shepherd’s hut is a pared-down home-from-home away from the distractions of modern life, offering the perfect place to relax in the evening. The Cool Camping collection features campsites for everyone including glamping pads which are out on their own for privacy and seclusion and adults-only campsites too. 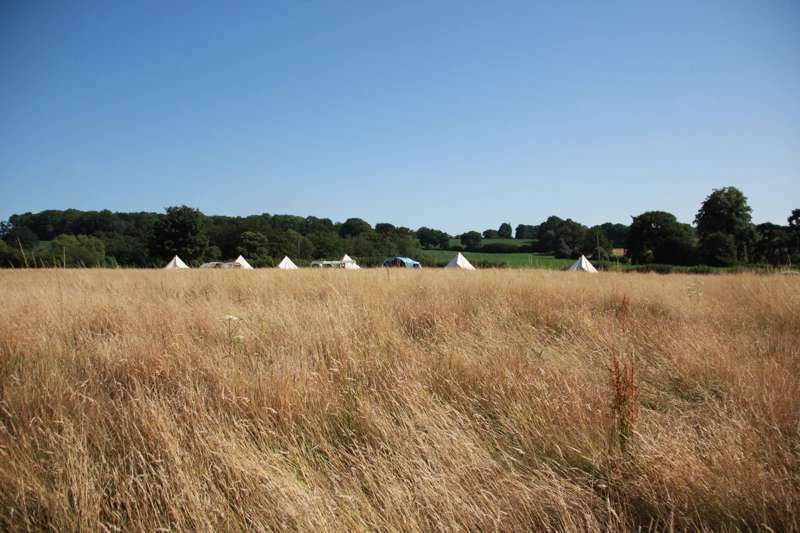 If it’s a quiet pitch you’re after, try booking your pitch or glamping pad for midweek and outside the school holidays. The South Downs is the youngest of England’s national parks, having been designated in 2010. Just over 600 square miles of rolling chalk hills are included in the park’s boundaries along with the historic city of Winchester, market towns like Petersfield, Arundel and Lewes, as well as plenty of picturesque villages. Wherever you choose to base yourself, the national park is easily reached from London and has great public transport links which mean you can leave the car at home and be at your South Downs camping or glamping site in an hour-and-a-half. It’s largely rural with farmland and ancient woodland patching the views which often stretch south to the sea. There are more than 2,000 miles of footpaths within the national park, including the ever-popular South Downs Way national trail. But walking is just one of the ways to enjoy the park with mountain bikers and horseriders also welcome to enjoy the ups and downs of its trails and bridleways. It’s not just the land that’s protected in the South Downs either. The park has several nature reserves within its limits as well as dozens of Sites of Special Scientific Interest where unique habitats have been recognised. In 2010, the national park became an International Dark Sky Reserve – recognising that it’s a great place for stargazing. In our opinion, that also makes it a great place for camping as sitting up late around the campfire gives you the ideal opportunity to watch the stars come out. One of the things the national park is best known for is the South Downs Way, the national trail that stretches from Winchester to the Seven Sisters chalk cliffs at Eastbourne. By national trail standards, the South Downs Way is relatively achievable at 100 miles in length. For average walkers it’s the work of eight to nine days, for cyclists, who are also welcome on the trail, it's two to three days. There are campsites all along the route, and just off it, which means you can easily combine tackling it with camping and glamping along the way. But, of course, you don’t need to take on the multi-day challenge of the entire South Downs Way to enjoy this waymarked trail. The idea of the national trails is that they showcase the best of the areas they run through, so even if you’re planning just a short walk or picnic in the area, joining a section of the South Downs Way makes for easy planning. The route, signposted with the national trail’s acorn icon, goes through the heart of the park, along the ridgeline, and is maintained by a trail officer. Thanks to the elevation, it is usually dry when other parts are boggy, and offers spectacular views. If you’re looking for things to do when you’re on a camping or glamping holiday in the South Downs National Park, start with the obvious and get out and enjoy the countryside in the way that suits you best. Grab an OS Map and plan a walk, run or cycle that will take you along the South Downs Way, across the park’s open access land or to the nearest picnic spot or pub for a well-deserved spot of lunch. Black Down, the highest point on the Downs, and Ditchling Beacon, near Brighton, are popular places to set out from. In terms of cities, towns and villages to visit; there’s a wealth of choice from historic Winchester at the Hampshire end of the park with its medieval cathedral to vibrant Brighton and Hove a few miles outside the park’s boundaries and closer to the eastern end. Petersfield, Midhurst, Arundel and Lewes are all charming market towns within the park that are worth visiting for their independent shops and historic buildings – including both Arundel Castle and Lewes Castle. Lewes also has a cool lido, Pells Pool, which has been open to the public for more than 150 years. The area is rich with manor houses and stately homes many of which have buildings or grounds which are open to the public. The Goodwood Estate, known for its horseracing and motor racing events, is perhaps the best known but there’s also Petworth House and Parham House. The South Downs is increasingly becoming known for its vineyards and wines too and many of them have tasting rooms and vineyard tours you can join. There’s family-friendly entertainment at wild animal parks at either end of the South Downs: Marwell Zoo near Winchester in the west and Drusilla’s in the east. To see native flora and fauna, head for the Queen Elizabeth, Goodwood or Seven Sisters Country Parks. And, of course, you’re never too far from the seaside resorts of the south coast and Brighton, Bognor Regis and Eastbourne all offer plenty of family fun with buckets and spades, amusements, ice creams and fun fair rides. south downs national park camping campsites glamping glampsites at Campsites in the South Downs, Find campsites in the South Downs with this expertly chosen collection of the best campsites in the National Park, all recommended by the authors of the best-selling Cool Camping guidebook series.